One of the weirder recurring intra-urbanist fights is about whether buses or trains are better. This seems like a deeply silly argument to me, akin to angrily taking sides about whether people should eat cereal or spaghetti. That is to say: surely that depends on the time of day, and surely the “best” transportation technology depends on context. I thought of this again when I read an old post Simon Vallée linked to this morning. (Simon has a great Montreal- and Japan-focused blog that you should read.) Generally, I’m not super interested in wading into these sorts of debates, but I thought his post was particularly useful both inasmuch as it emphasizes the importance of context, and then completely ignores the importance of context in order to draw the conclusion that, obviously, rail is better and anyone who disagrees is wrong wrong wrong. The crux of Simon’s argument, as I understand it, is that rail doesn’t just provide a superior qualitative experience: in the long run, it actually beats bus rapid transit at its own game. BRT is promoted as a low-cost rapid transit alternative, but because you can fit more people on a train than a bus, you can run fewer vehicles, pay fewer drivers, and actually save money. Simon provides charts to show how this is true, at least above a certain level of ridership. He doesn’t provide any sources for his cost estimates, so I wouldn’t actually take this as gospel, but he seems to know what he’s talking about, so for the sake of argument let’s assume all these numbers are right. (Actually, looking at them again, they seem to understate US rail costs compared to Alon Levy’s list, and overstate BRT costs, at least compared to Chicago’s projects. But whatever.) In that case, light rail is cheaper than bus rapid transit in the long run for any line with more than about 50,000 daily riders. Personally, I find LRTs more promising for the developed world…. The future of full-fledged BRTs in North America isn’t promising, at low riderships where they are cheaper than LRTs, the low riderships don’t actually justify the investments in BRTs, limited buses with bus lanes could achieve more or less the same quality of service. When ridership increases to the point where investing in BRT would be really better than just limited bus services or BRT-lite (like the SBS in New York), you’d probably be better off investing in LRT anyway, at least in the long-term. That means that in roughly 80-85% of US bus/rail arguments that are about an actual or potential piece of infrastructure, Simon’s own analysis suggests that he should be in the anti-rail camp. Or, you know, that this whole thing is more complicated than he’s letting on. * I would point out, also, that Simon’s cost savings come from having “three to six times” fewer vehicles running with light rail than BRT. That saves a bunch of money, sure, but it also means that vehicles come three to six times less often – meaning that a BRT line with buses every 5 minutes becomes a light rail system with trains every 15-30 minutes. And, in fact, many light rail systems in the US run on exactly those kinds of headways. At that point, light rail becomes hugely more of a hassle, since you have to build an extra 10-20 minutes into every trip to make sure you’ll be on time if you have a long wait for a train. Light rail can come more frequently, of course – but then it loses its labor cost savings over BRT. ** In my last nit-pick, I would also point out that Simon doesn’t do any discounting for future costs, which is not how any cost-benefit analysis has ever worked. That is, money in the future counts less than money in the present, not least because money in the present can be invested in things that produce value now. The lower initial costs of BRT are a bigger deal than he allows, I think. *** Finally, to ruin my opening metaphor, spaghetti is obviously better than cereal, even for breakfast. Thank you for your criticism, I do enjoy a lively debate. First of all, you said my numbers understated rail project costs and overstated BRT’s. However, the link you gave from Alon Levy’s website were about heavy rail projects, not light rail, and would be rather included in my “subway” category for which I put in an average of 250 million dollars per km, which isn’t far off from Alon’s website. For LRT, I used 60 million per km, or about 100 million per mile, which is, for instance, what the Montréal tramway project was budgeted as. I could have gone lower, most French tramway projects (which are LRT) cost between 20 and 50 million dollars per km (32 to 80 million dollars per mile). For the US, LRT projects since 1990 have cost between 27 and 91 millions dollars per mile, with one outlier being Seattle’s LRT at 168 million (but it’s elevated or underground on most of its route). So my 60 million/km, or 100 million/mile, is, if anything, a conservative estimate that overstate most LRT project costs. Likewise, for BRT, I estimated 15 millions per km (around 25 millions per mile). It may seem high, but that’s because I’m referring to proper BRT, running on an exclusive ROW, with proper stations and payment before entry, not just the “put a fresh coat of paint on buses, add Wi-Fi, remove stops and call it a day”-BRT-lite projects that often offer little to no service improvement over regular buses. For the record, Gatineau’s BRT (the Rapibus) was recently built for 255 million dollars for a 12-km route, so that’s about 21 million dollars per km, or around 35 million dollars per mile. The Pie-IX BRT in Montréal is estimated even more than that. Los Angeles’ Orange Line had 14 miles of exclusive ROW built at a cost of 324 million dollars, that comes out at about 14 million per km, quite close to my estimate. The costs per passenger are harder to defend as this varies a lot depending on distance traveled and speed. However, from analysis of Canadian transit companies, most bus-only services have operating costs around 4-5$, even Ottawa with its BRT has a cost of about 3,90$ per passenger. Meanwhile, Calgary Transit, with two well-used LRT lines, have an operating cost of about 3,10$ per passenger. If both systems have half of passenger-miles on their BRT/LRT, that would mean a cost advantage of about 1,50$ per passenger in favor of LRT. I put in a single dollar advantage. Now, about your main point, that most corridors considered for LRT have less than 50 000 people per day in ridership, that is correct. That being said, the cost difference from about 35 000 passengers per day is nearly negligible, especially considering that rail transit has been estimated to draw about 30% more riders than bus transit for the same level of service. But beyond all of that, what I’d ask is: are you planning for success or failure? The idea that because the predicted ridership is low, we have to offer only the lowest level of service to serve that predicted ridership stunts transit. With LRT, you have room for growth, and the more you grow, the more you build TOD, the greater the advantage of choosing LRT will be. So if we are to be ambitious, to really hope to achieve something with transit beyond offering marginally better service for the small number of people who already use it, I think investing more today so that tomorrow you can rely on this structural infrastructure to reshape cities is a wise approach for the long haul. That doesn’t mean I favor building LRT everywhere. No, I think main corridors in cities should be identified and LRT be built in these. For the secondary corridors where growth will be limited, then I entirely agree that ridership there doesn’t justify rail investment. But likewise, it is quite likely that they don’t justify BRT investments either. With riderships of 20 000 people per weekday and under, supposing you don’t need very high speeds (as is the case with commuter rail), you would probably be better off just buying articulated buses, eliminating half of bus stops (running a Limited bus) and with judicious application of bus lanes to protect the buses from congestion, you would probably offer similar speed to BRT for peanuts. Québec City did it in the early 90s with its “Metrobus” lines, high-frequency straight lines with limited number of stops and with specially marked articulated buses, running on bus lanes on major arterial streets of the city. They did increase ridership (though much of it was cannibalized from nearby parallel lines) and helped to simplify taking transit at the very least as all network maps clearly identify the Metrobus lines, so people know that if they go there, they will have frequent, reliable bus service all day along these streets. So essentially, BRTs as far as I see are squeezed out between “quality” bus lines for ridership 20 000 and under, and LRT, which starts becoming viable at 35 000 passengers per day versus BRT and offer much more room for growth. 1. I was unclear; I was referring to your HR numbers re: Alon’s numbers. As far as BRT, I was going off of Chicago’s proposed Ashland route, which is full-bore with prepaid stations and everything and is projected to cost $10 million per mile. But that could be an outlier. 2. I’d be interested in reading the 30%-more-riders studies – I’ve read others that suggest that for similar levels of service, the gap is much, much smaller. 3. I’m with you that the most important improvements to make in North American cities along all but the most heavily-trafficked corridors are just basic improvements to bus service. But I guess I also think that at least in the context of contemporary American cities, where money is very tight, the up front money is a real impediment, and BRT is an acceptable substitute for most of the actual corridors under consideration. There is also the issue of frequency – a light rail line with 15 minutes headways is not necessarily “better service” than BRT with 5 minute headways. Your projected operations savings, by definition, have to come from much worse frequency along LRT routes; I think that’s a serious concern. 1. I think my heavy rail numbers are on the money… except for American projects that have a lot of trouble to keep costs down. As to the Chicago BRT projects, we’ll see. -Track vs roads: laying tracks or building concrete roads on which the vehicle will travel (asphalt doesn’t do it for buses as they will trash it quite quickly), both these costs are roughly equal. If you already have a roadway that can support frequent bus travel always in the same lines, then you can save money for BRT here, if not, you can’t, it’s a tie. -Electric lines: LRT is generally electric, which means that you need to create a way to power the vehicle, which can be as expensive as the tracks themselves. With diesel buses, you don’t have to worry about this, but you will have higher operating costs because of the price of fuel. As most BRT are diesel only, they save money upfront on this, but pay for it perpetually, plus the pollution. If you use trolleybuses instead, construction costs would be much higher. -Vehicles: the longer the line, the more vehicles you have to buy to obtain a given frequency, hence it’s also a cost per mile of line. Here, rail vehicles are much more expensive, but last two to three times longer than buses, and possibly even more (but people are largely unwilling to tough it out with very old vehicles, it’s not that they break down all the time and can’t do the work, they’re just not up to the quality people expect nowadays). Again, LRT has higher construction costs but vehicles with longer life expectancy, just looking at initial cost and ignoring the fact that you will need to buy new vehicles every 10-15 years instead of each 25-30 years seem to me to be shortsighted. -Garages: this is mainly a first time cost. 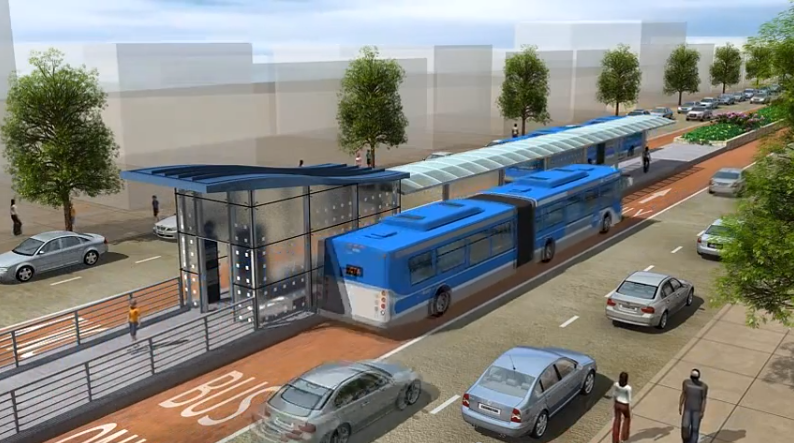 BRT can avoid it but only if they reuse the same buses as the transit operator currently uses, otherwise they will have to build new garages to accommodate the new buses. -Cost of tunneling/expropriation/building viaducts and bridges: this is irrelevant to the mode, but dependent on the right-of-way that is chosen. In fact, LRT have the advantage here as they require smaller lanes (being guided) and can operate in tunnels without fear of asphyxiating their passengers. -Stations: same cost no matter if with buses or trams. -Various other stuff added to projects: this is often political, beautification projects are often added to transit projects, or even nearby road projects are lumped in too. Again, this is irrelevant of mode. So overall, why is BRT cheaper? It’s not the track, not most of the time. It’s the lack of electric lines and the cheaper vehicles, which have to be changed much more frequently. Just an analysis of these costs show that yes, you’re saving in the short term, but by dumping costs in the future, even without talking of labor costs. 2- I haven’t kept the links unfortunately, but I know that Ed Tennyson is the expert who made extensive ridership comparisons between bus and rail transit and I think it’s from his study I chanced upon that I remember the 30% number. 3- Actually, I think that money is nowhere near as tight as you say. Just look at the billions put towards useless highways all across North America. Money is there, it’s only a matter of political will. Furthermore, I think the issue of political reality actually ADVANTAGES rail. What I mean is that in both Canada and the USA, Federal and State/Provincial governments have shown willingness to contribute to infrastructure investment, but much less willingness to assume operating costs of transit operators. For example, in Québec, the province pays 50-75% of capital costs of transit agencies, but only 15-25% of operating costs. So transit agencies should try to get “money from above” to build transit systems that are less costly to operate in the long run, because cities, which are more cash-strapped, have to assume almost on their own the operating costs. If they can’t, they’ll cut down on service. As to the matter of headways, I think that is not as big an issue as you make it out to be. When you get below 10 minute headways, there is little service to gain from higher frequencies. Corridors that justify investments for BRT or LRT also tend to have high enough ridership to justify better headways than once every 15 minutes, even in the US. Even the Buffalo LRT (one of the most lackluster examples of LRT with less than 16 000 riders per day) has an headway of less than 10 minutes during peak hours. In off-peak hours, trains can run more frequently than they need to in order to provide lower headways. 4 2-car trains can carry the same number of people as 12 articulated buses, but it doesn’t stop you from running 6 of them if you want in off-peak periods. Yes, it will mean higher operating costs during these hours, but this is balanced by the lower operating costs during peak hours (when most riders actually take transit). There is also another issue about headway: Traffic Signal Priority. For surface-running transit, getting priority at traffic lights is a great way to speed up service. However, this signal priority doesn’t work if transit vehicles come too often, because then they take over traffic lights way too often and disturb not only cars, but also pedestrians and cyclists wishing to cross. The ability of LRT to keep headways higher in this case can be an advantage. I think LA’s BRT orange line is limited in capacity exactly by that, they can’t run more buses because then it would jam major intersections or force them to disconnect traffic signal priority. I don’t think operating costs in the $3-4/passenger ratio are an issue of buses versus trains. In Vancouver, the trunk bus routes’ operating costs start at well below $1 per passenger and go up to about $1.50. The Expo and Millennium Lines are a bit more than $1 per passenger (but with longer average trips). In New York, operating costs per bus trip are $3 and operating costs per subway trip are $2. If you’re finding yourself spending $3-4 per passenger, you’re disproportionately running low-ridership branch lines. 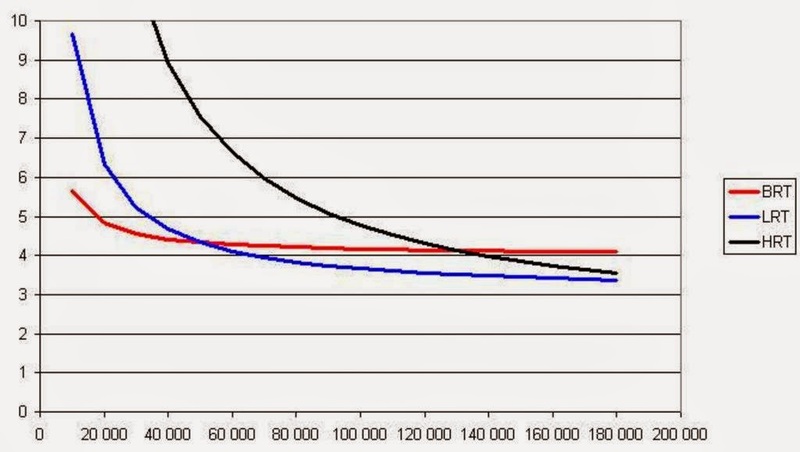 The use of cost per passenger presumed equal lines and equal travel distances per passenger. I find it highly doubtful that any bus route has a cost per passenger of less than 1$, unless users travel one mile or less on average. If it was, as the trunk buses carry a lot of riders and transit in Vancouver isn’t especially cheap, you’d expect to see a very high farebox recovery ratio, and it’s just 52%. Translink (Vancouver’s transit agency) has 148 million boardings on buses and 81 million boardings on rail (Skytrain+Canada Line+West Coast Express), and it spends 643 million dollars on operating expenditures for buses and 260 million dollars for rail. Which comes out at 4,35$ per passenger on buses and 3,21$ on rail (I’m assuming much longer trips on average on rail too). I also found a document reporting operating cost for the Skytrain and buses separately, but none that speak only of trunk buses. *Toronto’s system is partially a streetcar. I think that’s really all I’m saying. I thought the post as written, though, provided all this lovely context re: costs and frequency tradeoffs and then came down on the side of, “actually, LRT is still always better,” which I thought was a shame. I didn’t say it was always better… it’s just that for riderships at which BRT beats LRT, simple limited buses likely beat BRT by offering similar service at lower cost. BRT seems to be squeezed out between a better option at lower ridership levels (limited articulated bus routes) and a different option at higher ridership levels (LRT), which gives very little space in which proper BRT is really the good solution, at least in a North American context.